Windows 8/8.1/10 users may notice disk usage 100% problem. When you open the Task manager and you see that disk usage stuck at 100% and your computer working really slow, or when you run some programs and disk usage goes up to 100%, then you are in the right place. In this post, I will show you how to fix that problem. 1) First of all open Run on your computer using Win+R keyboard shortcut and type in services.msc and hit enter. 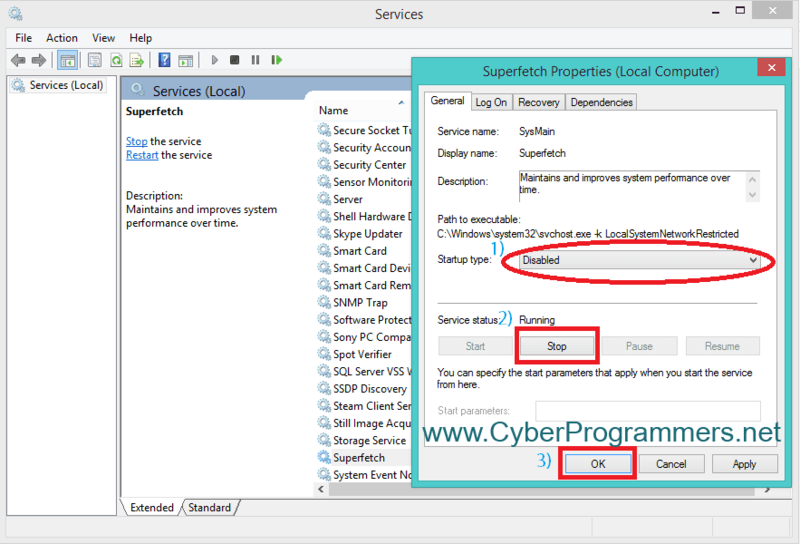 2) Now in Services window scroll down and search for Superfetch. 3) After you find it, right click on it and select the properties. 4) Now in new opened small window click on the drop-down menu and select Disabled. Press the Stop button and press on the OK button. Now you can check disk usage on your computer. It must work much better. If you still have a problem, the try to turn off some Startup programs.